Beautifully furnished Downtown Luxury 1 Bedroom 1 Bath condo within walking distance to everything Portland has to offer. Enjoy the fabulous location of the new 113 Newbury luxury condos centered between Portland's Old Port and the trendy East End neighborhoold. The condo is luxury at its best with an open concept sleek modern design and sophisticated furnishings. This wonderful India Street neighborhood is known as the premier residential neighborhood for its walkable, urban living. 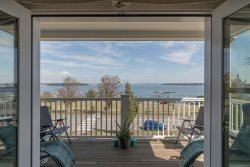 The condo includes attention to all the details with custom cabinetry in the kitchen and baths, stone counters, gas fireplace, hardwood floors, high efficiency heating and cooling units, a private deck and off street parking for one vehicle.